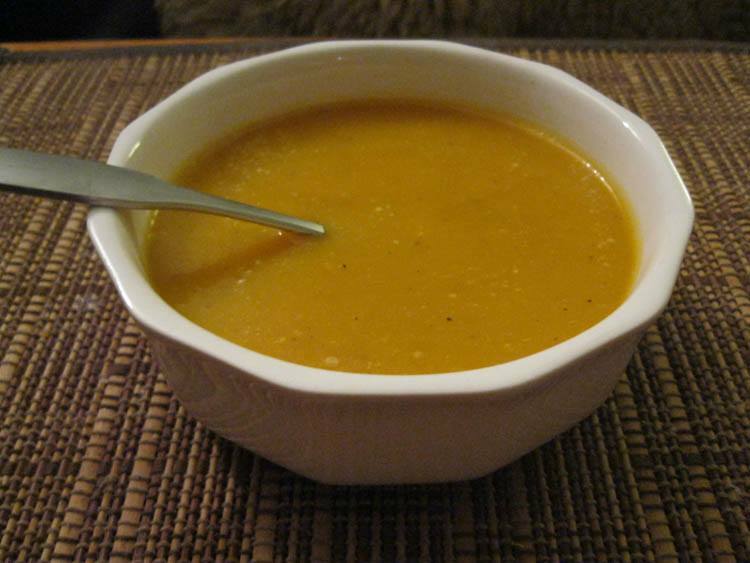 This butternut squash soup recipe makes and quick and easy meal. With just four ingredients it makes a great homemade dinner, best served with warm bread and butter. It will warm you up and make you feel good. Butternut squash days to harvest is about 100 days – which means this squash is ready to pick in early fall, at about the same time pumpkins come on the market. 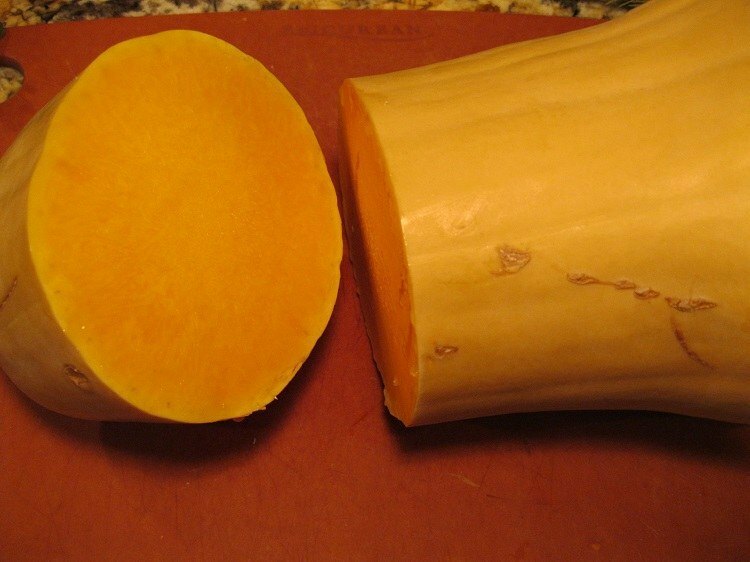 When purchased, be sure that the stem is still on the butternut squash, since this will extend the life of the squash when it makes it home. 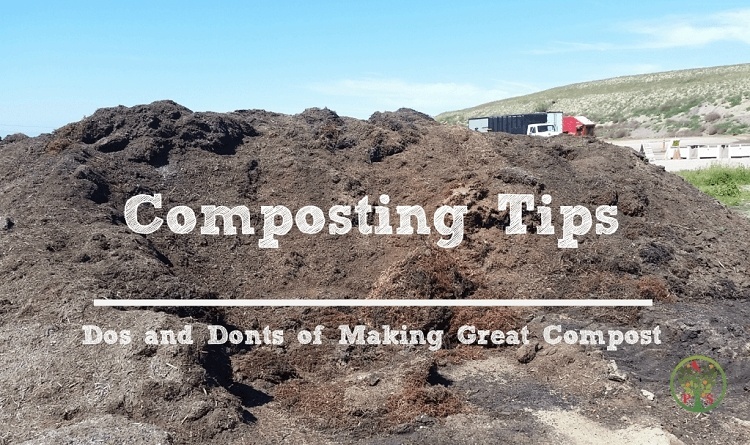 If you are not going to use it right away, store it in a cool, dark place. Peel one medium butternut squash and cut into 1-2 inch cubes. 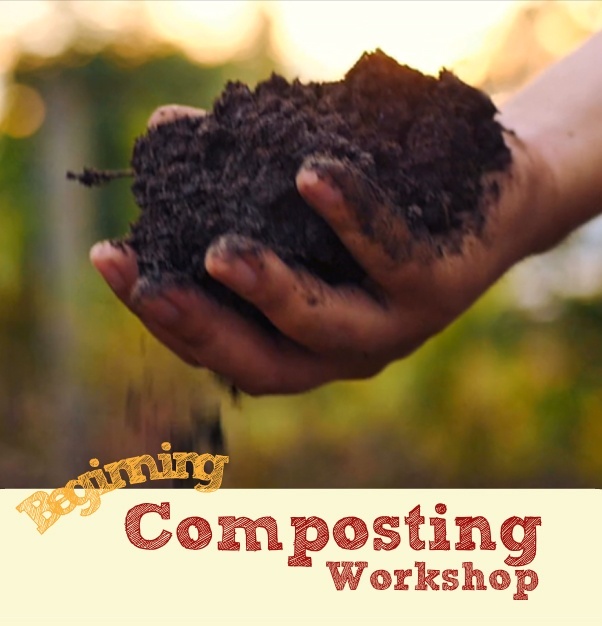 Remove seeds. 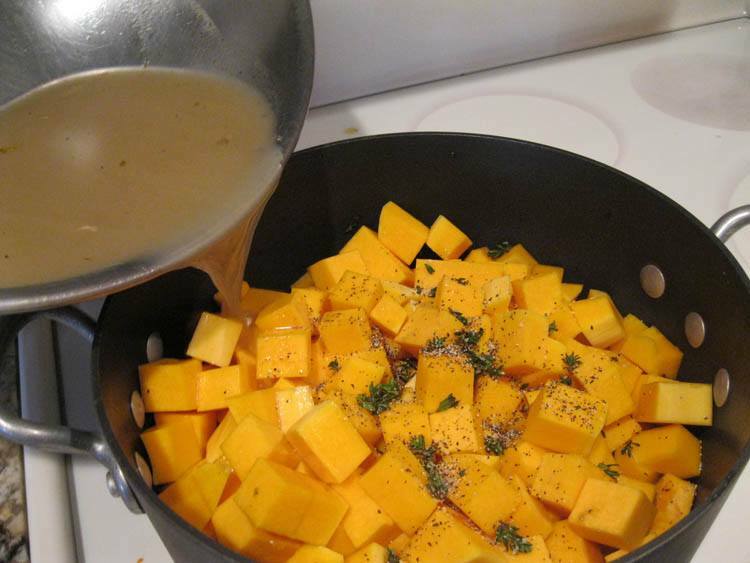 Place cubed butternut squash in a medium sized sauce pan. 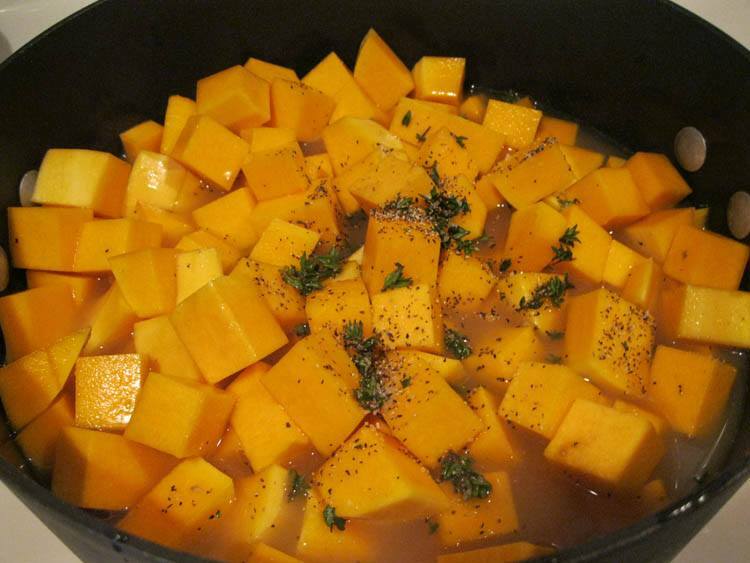 Use about 1 quart of either vegetable or chicken broth and pour over the cubed butternut squash in the pot. Homemade broth is best, but if you don’t have the time, use Organic broths to avoid the manufacturer sneaking in MSG-derived flavor enhancers that occur in many non-organic vegetable and chicken broths (disguised under the “natural flavors” on the label). Add 1 tablespoon sherry wine, 1/2 tsp fresh thyme and salt and pepper to taste. If you don’t have fresh time, use about 1 tsp dried thyme. If you like a bit of spice, add a dash of cayenne pepper to the mix. 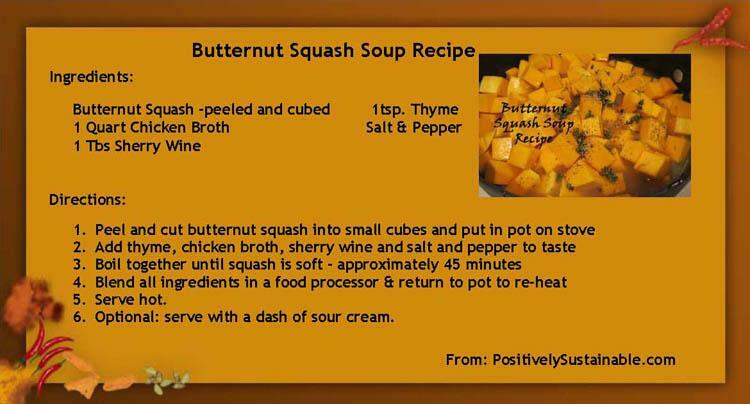 The soup mixture should be boiled until the butternut squash is fork tender, about 30-45 minutes. The longer it boils, the better the soup will taste, so if you have time, leave it on the stove for longer. Take the hot soup mixture and blend it. 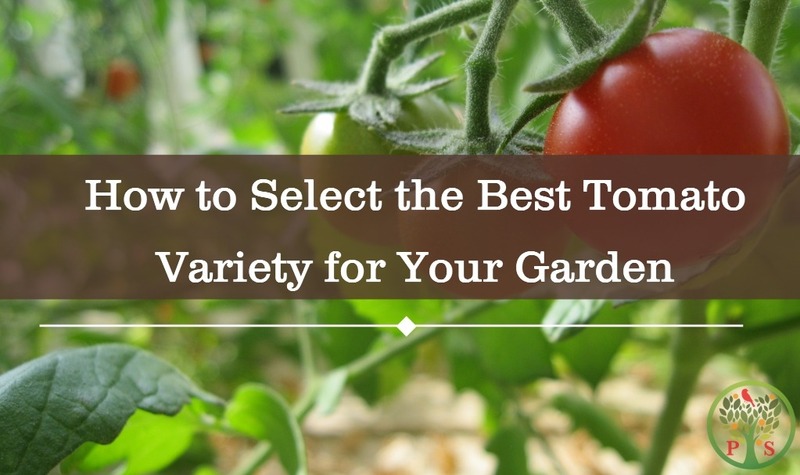 A traditional blender works best since the result is a smooth and creamy texture. The soup will be hot, so fill only half way up the blender and put a towel over the lid and turn on at low speed at first. 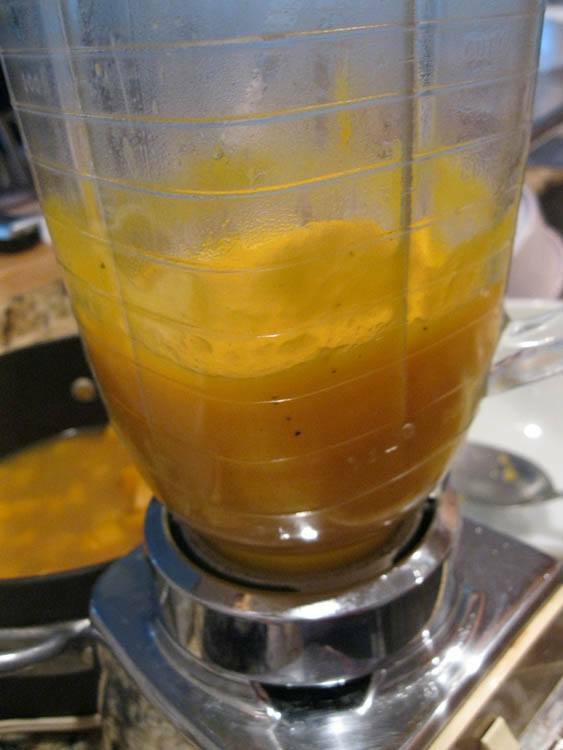 The soup will expand and can blow the top off if the blender is filled too full. Gently turn up speed and blend until smooth. Return soup to pot and reheat when ready to eat. 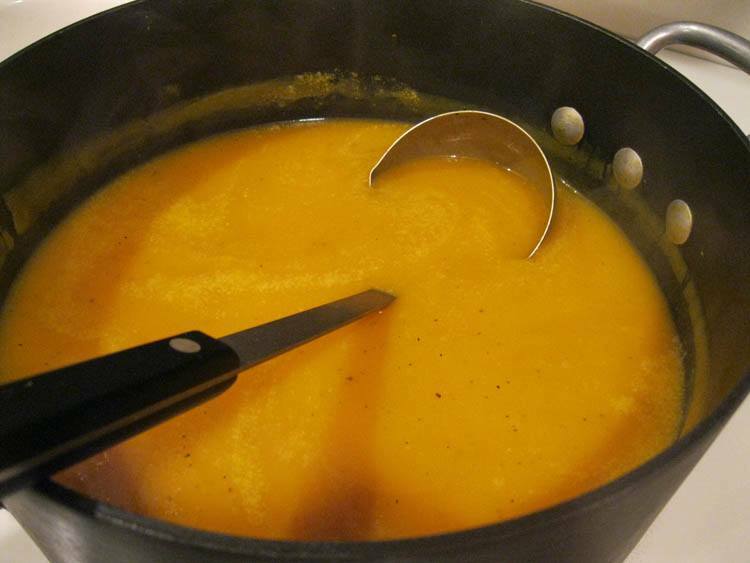 Once the butternut soup has been thoroughly blended, transfer it back to the pot to re-heat until dinner is ready. Serve hot, maybe with a dab of sour cream. Serve the soup hot and your family will be loving you. Add a dash of sour cream to the top if you desire the soup to be a bit creamy. Crispy bacon or home made croutons can also add a lot of flavor if you have that at hand. 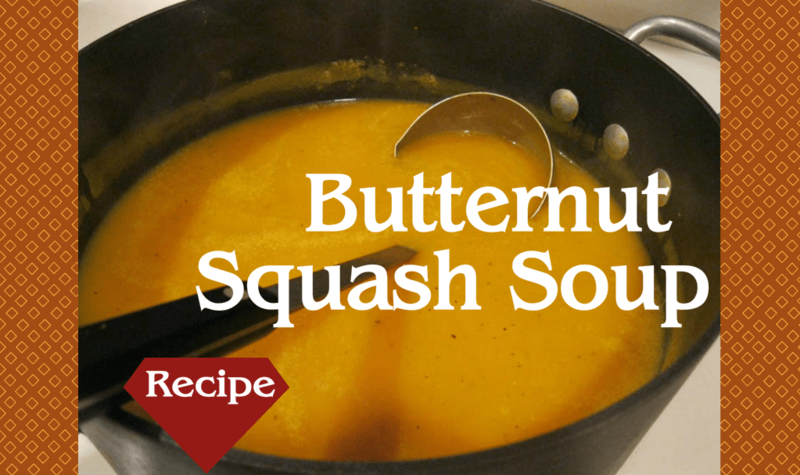 Got more butternut squash you need to use? Try Bowl of Roots: Roasted Vegetables recipe.